Tired of looking at that faded, worn out, loose mirror interior panel then check out UPR's Billet Mirror Interior Trim Bezel for your 87-93 Mustang. Our Billet Trim Bezel was created as a factory replacement for the plastic trim piece after seeing so many Mustangs with damage to them over time. The new piece won't fade and also gives your interior a great look. 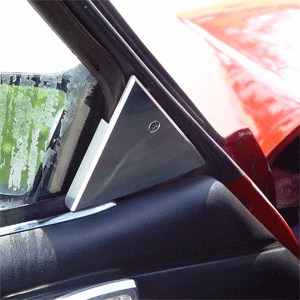 Crafted from Billet Aluminum and designed to replace your factory plastic mirror trim bezel. 1987 1988 1989 1990 1991 1992 1993 GT LX Mustang Steeda Roush & Saleen Vehicles. No one else can stack up to the bold clean styling of our aftermarket Billet dress ups, Street Strip & Racing Suspension & Performance Parts for your late model American Muscle Car!